Keeping your hands warm while skiing (both downhill and cross-country), snowshoeing, fat biking, or simply spending the day outside in the winter can be a constant struggle. Heat packs in the back of your gloves don't always provide enough warmth for the whole hand, while heated gloves powered by D-cell batteries tend to be heavy and bulky. And ​lets be honest, those chemical packs that some outdoor winter athletes prefer only heat up your palms and aren't particularly useful for keeping the tips of your fingers warm too. Mittens, with a chemical hot pack inside, can be a viable alternative of course, but they're awful for skiing, making it difficult to grip your poles properly. So what's a winter athlete to do when their fingers end up tingly after just an hour in sub-freezing weather? Why, add a pair of Zanier Heat-GX heated gloves to their wardrobe of course. These gloves have an improved design that actually heats the thumb and fingertips, rather than just your palms, all without the use of bulky battery packs. Sporting a proprietary microprocessor in the gloves themselves (which designers have dubbed "Impulse Control") that stimulates fingertip blood circulation, the Zanier-GTX models are unlike any other on the market. The control buttons are simple to use and are within easy reach right on the back of the hand. To activate, simply hold the plus button on the glove to turn it on and increase the heat. Repeat the process in the other direction using the minus button to decrease the heat or turn the unit off. An LED light embedded in the glove indicates the heating level. On its lowest setting, the battery is capable of powering the gloves for up to 12.5 hours hours at a time. If you need a little extra warmth, turn the temperature up to the mid-level (at 98.6 degrees), which cuts battery life down to just five hours but will keep your hands cozier in the process. Optional battery packs can be purchased separately to help extend run-time throughout the day. The batteries, which are waterproof and shock-resistant, sit in their own cuff pockets, and are light enough that you barely even notice that they are there. There is no doubt these gloves work well. The pair we tested had an adjustable, integrated heating system that keeps fingers warm for a full day of skiing without having to lug around a bulky pack of D-cell batteries on the wrist. Additionally, Zanier's models are much more comfortable and efficient than those crunchy chemical packets that only heat your palms. Indeed, these options from Zanier are warm, efficient, and extremely easy to use, while providing long battery life and warmth for the entire hand. A proprietary microprocessor stimulates fingertip blood circulation. 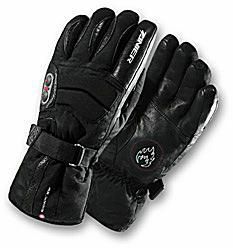 Gloves are windproof and incorporate a Gore-Tex membrane layer so they are waterproof and breathable as well. Batteries provide power for 12.5 hours on lowest setting and more than five hours on medium setting. The runtime drops to 2 hours on the highest setting, although backup batteries can be used to extend the use of the gloves indefinitely. Zanier's technology is offered in mittens, foot warmers, pants, jackets, and other products as well. Note: When traveling with these gloves, be sure to remove the lithium-ion batteries before putting them into checked baggage. Most airlines now require you to carry all batteries of that type with you onto the plane before taking off. Searching for good travel gear? These companies and websites can help!